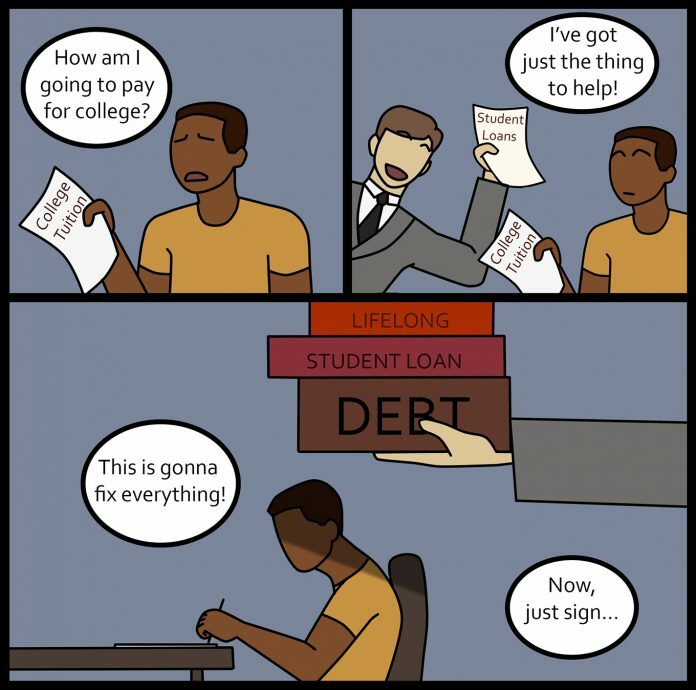 Another economic collapse is on the horizon in the U.S. and rather than blaming General Motors or the housing market, the culprit will be the student loan crisis if it continues to go ignored. Access to the greatest vehicle for economic opportunity has become more costly in both time and money, which poses a huge problem for this country going forward. In 1968, a student working 6.2 hours a week at minimum wage would earn enough to pay the average annual tuition and fees of $385. Of course, this was when education was considered a public good and not a private investment. Now more students must borrow money to finance their education, and the number of those who can’t keep up with payments on loans after graduation is increasing. Since 2003, U.S. tuition and fees have increased 91 percent. Since 2004, U.S. student loan borrowers have increased by 92 percent and the number of borrowers defaulting on loans rose 125 percent, according to the National Conference of State Legislatures. This is a national crisis. In fact, 44.2 million Americans have student loan debt, which accounts for $1.48 trillion of the country’s debt. Of that debt, 11.2 percent of the loans are delinquent or in default, which is higher than the foreclosure rate at the height of the mortgage crisis eight years ago. Student loans have become a limiting cycle of debt many can’t find their way out of. Not only does defaulting on student loans impact a person’s credit, making it more difficult to purchase homes, cars and rent apartments, it’s also impacting their ability to pay them off. In 20 states, including Texas, defaulting on a student loan can result in the suspension of a person’s professional license. Nurses, teachers and other professionals who need state-issued licenses to practice can be stripped of their ability to work. This only further compounds the difficulty in repaying loans. That rule has got to go. For the U.S. to be successful, it needs to replace those leaving the workforce with those that have the necessary qualifications and education. With more jobs demanding at least the completion of a bachelor’s, if not a master’s, the way higher education is viewed has to shift. Former presidential candidate and current U.S. Sen. Bernie Sanders was onto something regarding free college. How to go about doing that is up to government entities, but serious consideration should be given to investing more into higher education and dropping the cost of college to a more manageable price. People also need to be better educated about the potential impacts of student loans, the different kinds of loans available and what is required when it comes time to pay them back. Indiana University found students buckled down, graduated faster and borrowed less when they sent letters to students with facts about their loans. It had such an impact that Indiana officials required all colleges receiving state aid to send similar letters to students. Texas and federal lawmakers should consider doing the same. Financial literacy is vital for future success. The more aware students are of their options and future implications of their choices, the better they can plan and prepare for their future, which could save them from crippling debt. A college education is an investment and sometimes borrowing money has to happen, but it shouldn’t result in crippling consequences. For us to reach our full potential, we must allow students and families to meet theirs. The future of Texas and America depends on how we respond to this crisis and hopefully we do so before it leads to another economic downfall.